The initial batch of records for the Winter and Krüger family in Trieglaff were obtained fo me by Martin Sohn. 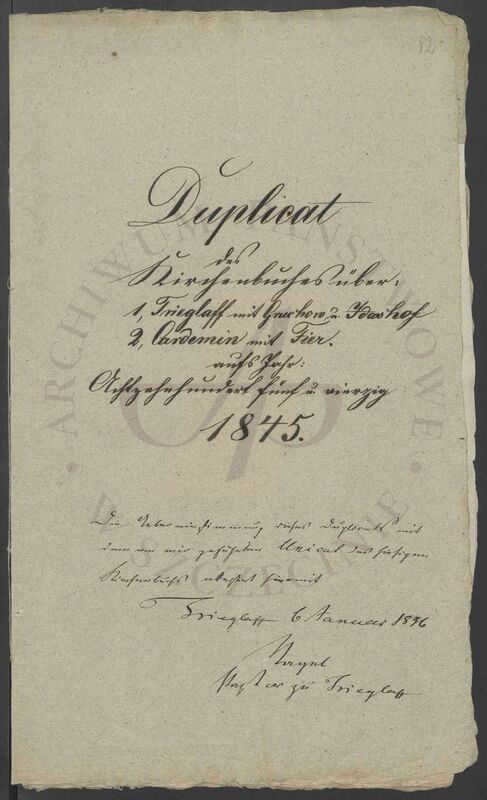 Since then I have discovered that Trieglaff records are actually available online from the Polish national archives, so I’ll likely be adding to this collection in the future. The records are online here, and go from 1842 to 1874 (presumably after which the more detailed civil records were used). 1842. Nr. 3. Trutzlatz. To Johann Friedrich Hartkopf, kossäth, and Caroline Wilhelmine Krüger, a daughter, Caroline Friedrike Wilhelmine Hartkopf, born 21 Jan 1842 and baptized 23 Jan 1842. Godparents: Friedricke Will née Winter, farmer’s wife, Friedricke Louise Krüger née Zastrow, Gottlieb Friedrich Callies, farmer. (Trutzlatz 3/1842). Nr. 8. Trieglaff. To the schneider Carl Gildemeister from Greifenberg and Wilhelmine Friederike Buth, a daughter Mathilda Ida Caroline Gildemeister, born 2 Apr 1842 and baptized 17 Apr 1842. Godparents: Mrs. Hoge née Buth from Trieglaff (likely Ida Minna Bertha Buth, wife of Carl Heinrich Hoge), Caroline Neuthal from Greifenberg, the müllergesell Buth from Luttkenhagen. (Trieglaff 8 1842). 1844. Nr. 11. Idashof. To the laborer Joachim Friedrich Wilhelm Winter and his wife Hanriette Charlotte Friederike Ramtnun, a daughter Caroline Henriette Auguste Winter, born 13 May 1844 and baptized 16 May 1844. Godparents: The laborer Carl Gauger, Caroline Ramthun, Caroline Winter. (Treiglaff 11/1844). 1844. Nr. 49. Zimmerhausen. To the küster and schulehrer Carl Friedrich Wilhelm Schmidt and Johanne Louise Milarch, a son Johann Martin Julius Schmidt, born 3 Nov 1844 and baptized 1 Dec 1844. Godparents: Herr Martin Gottliebg Milarch, ?? from Zimmerhausen, Johann Krüger, halzermeister from Zimmerhausen, Mrs. Wilhelmine Milarth née Voigt from Zimmerhausen. (Trutzlatz 49/1844). 1844. Nr. 11. Marriage of the schneider from Trutzlatz, Carl Ludwig Böttcher, age 27, not previously married, and Miss Friericke Caroline Krüger, age 21, daughter of the laborer Christian Friedrich Krüger from Trutzlatz on 27 Dec 1844. 1845. Nr. 7. Trutzlatz. Death of the farmer and eigenthümer Carl Gotthilf Krüger, age 48 years, 2 months, 16 days (b 3 Jan 1797) on 19 Mar 1845 from ??. Burial on 22 Mar 1845. Leaves a widow, 1 young son, a ? ?, three small children total, and his parents. (Trutzlatz 7/1845). 1845. Nr. 1. Zimmerhausen. Marriage of the laborer Carl Friedrich Wilhelm Wendt, age 24 3/4 years, with Hanna Sophie Krüger, age 19, daughter of the alsitzer Ludwig Krüger from Zimmerhausen on 28 Mar 1845. (Trutzlatz 1/1845). 1845. Nr. 6. Zimmerhausen. Marriage of the laborer Ferdinand Friedrich Krüger, age 24, and Caroline Wilhelmine Henriette Tugendreich Hannemann, age 22, daughter of the laborer Christian Friedrich Hannemann from Zimmerhausen, on 19 Sept 1845. (Trutzlatz 6/1845). 1845. Nr. 50. ZImmerhausen. To the laborer Carl Winter and Louise Stark, a son Johann Friedrich Wilhelm Winter, born 17 Nov 1845, baptized 30 Nov 1845. Godparents: The laborer Kroncke from Zimmerhausen, the laborer Stak from Kukahn (West of Greifenberg), Miss Wilhelmine Strohahn from Zimmerhausen. (Trutzlatz 50/1845). 1845. Nr. 59. Zimmerhausen schäferei. To the laborer Wilhelm Dummann and Hannah Krüger, a son Carl Wilhelm Heinerich Dummann, born 27 Dec 1845 and baptized 31 Dec 1845. Godparents: Wilhelmine Krüger née Hawemann from Zimmerhausen schäferei, the laborer Heinerich Ruhnike from the same place, the knecht Heinrich Knuth from Tonnenbuhr. (Trutzlatz 59/1845). 1846. Nr. 16. Zowen. To the laborer Albert Krüger and Caroline Krüharke, a son Carl Friedrich Albert Krüger, born 24 May 1846, and baptized 1 Jun 1846. Godparents: The laborer Heidke from Tonnenbuhr, the knecht Köpsell from Zowen, the ?? Caroline Conell from Zowen. (Trutzlatz 16/1846). 1846. Nr. 21. Zowen. To the budner Carl Ludwig Köller and Hanna Caroline Louise Zastrow, a daughter Friedricke Louise Wilhelmine Köller, born 26 Jun 1846 and baptized 8 Jul 1846. Godparents: the halbbauer Krüger from Zown, the farmer’s wife Hanna Just. from Zowen, Albertine Herzberg from Zowen. (Trutzlatz 20/1846). 1846. Nr. 32. Zimmerhausen. To the farmer Johann Heinrich August Knuth and Henriette Ernestine Louise Krüger, a daughter Elisabeth Charlotte Louise Knuth, born 6 Sept 1846 and baptized 20 Sept 1846. Godparents: Mr. Eduard Blankenburg, Mrs. Böhn, Mrs Hedwig Blankenburg, all from Zimmerhausen. (Trutzlatz 32/1846). 1847. Nr. 6. Triglaff. Death of Carl Heinrich Wilhelm Hoge, son of the miller Carl (Heinrich) Hoge on 5 Feb 1847 at the age of 8 years, 4 months (b 1 Feb 1839). (Trieglaff 6/1847). 1847. Nr. 23. Cardemin. Death of Anna Maria Hoge, wife of the laborer Carl Havermann on 28 Apr 1842 aged 56 years, 8 months, 1 day (b 27 Aug 1790). (Trieglaff 23/1847). 1847. Nr. 25. Trutzlatz. To the eigenthümer Carl Zastrow and Friedricke Krüger a daughter Ulricke Louise Emilie Zastrow, born 11 Nov 1847 and baptized 22 Nov 1847. Godparents: Wilhelmine Hartkopf in Trutzlatz, the schneider’s wife Will from Gülzow, the farmer’s son Zastrow from Trutzlatz. (Trutzlatz 25/1847). 1866. Nr. 5. Trieglaff. To Ferdinand Krüger, day laborer in Trieglaff and his wife Friedericke Stock, a daughter, Bertha Auguste Wilhelmine Krüger, born 10 May 1866, baptized 21 May 1866. Godparents: The farmer’s wife Ulricke Schochow née Magenberg from Rensin, Miss Wilhelmine Stumke, day-laborer’s daughter from Koplin. The herdsman (Schäferknecht) Friedrich Greisbuch from Coldemanz. (Trieglaff 5, 1866). 1867. Nr. 8. Trieglaff. To Ernst Friedrich Wilhelm Müller, laborer from Trieglaff and his wife Bertha Winter, a son Otto August Wilhelm Müller, born 25 Jul 1867 and baptized 4 Aug 1867. Godparents: The knecht Wilhelm Zarling, the farmer’s son August Kannenberg, Miss Friederike Wilhe, household servant (dinstmadchen). All from Trieglaff. (Trieglaff 8/1867). Notes: From Posen, not Pommern. b 23 Nov 1854 – d 15 Dec 1942. Wife Caroline Wilhelmine Ringhandt b 7 Mar 1857. Children: Amalie, Ida, Mollie, Hermann, Gustav, Adolph, Dorothea. Certificate: Vol 7, page 68. Certificate: Vol 1, page 34. This document is an attempt to outline what we know about the family of my 3x-great-grandmother Wilhelmine Winkelmann (1836-1914). Her family, like the family of her husband Carl Friedrich Schmidt, lived in Kreis Friedeberg in Posen, Prussia, and then moved to the towns around Karolina and Stieglitz in Kreis Czarnikau, some distance to the East. Kreis Friedeberg showing Bergdorf, Modderpfuhl, Pehlitz, Weissfenn, and Driesen (near Alt-Beelitz). 1808 – Bergdorf, Kreis Friedeberg – Birth of Christian Julius Winkelmann, per his death record. 29 Mar 1814 – Pehlitz, Kreis Friedeberg – Birth of Johanna Charlotte Börk, per her death record. abt 1835 – Likely Kreis Friedeberg – Marriage of Christian Julius Winkelmann and Johanna Charlotte Börk. 20 Dec 1836 – Bergdorf, Kreis Friedeberg – Birth of Wilhelmine Winkelmann to Christian Julius Winkelmann and Johanna Charlotte Börk. 1839 – Bergdorf, Kreis Friedeberg – Birth of Hannah Auguste Friedricke Winkelmann to Christian Julius Winkelmann and Johanna Charlotte Börk. 1841 – Bergdorf, Kreis Friedeberg – Birth of Carl Julius Winkelmann to Christian Julius Winkelmann and Johanna Charlotte Börk. 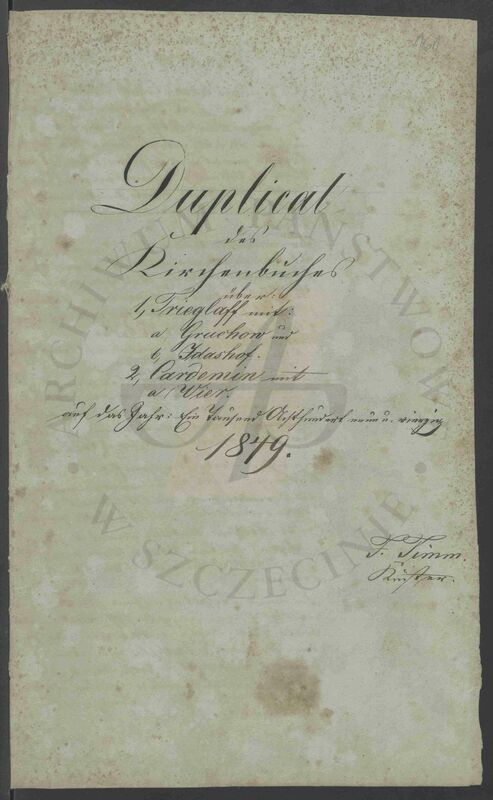 4 Jun 1843 – Alt-Beelitz, Kries Friedeberg – Birth of Christian Friedrich Winkelmann to Christian Julius Winkelmann and Johanna Charlotte Börk, per his death record. 25 Sept 1847 – Bergdorf, Kreis Friedeberg- Birth of Franz Hermann Wilhelm Winkelmann to Christian Winkelmann and his wife Johanna Charlotte née Börk. Dec 1850 – Bergdorf, Kreis Friedeberg – Birth of Antonie Francesca Ottilie Winkelmann to Christian Winkelmann and his wife Johanna Charlotte née Börk. 6 Apr 1855 – Bergdorf, Kreis Friedeberg- Birth of Marie Pauline Winkelmann to Christian Winkelmann and his wife Johanna Charlotte née Börk from Carolina, per her marriage record. 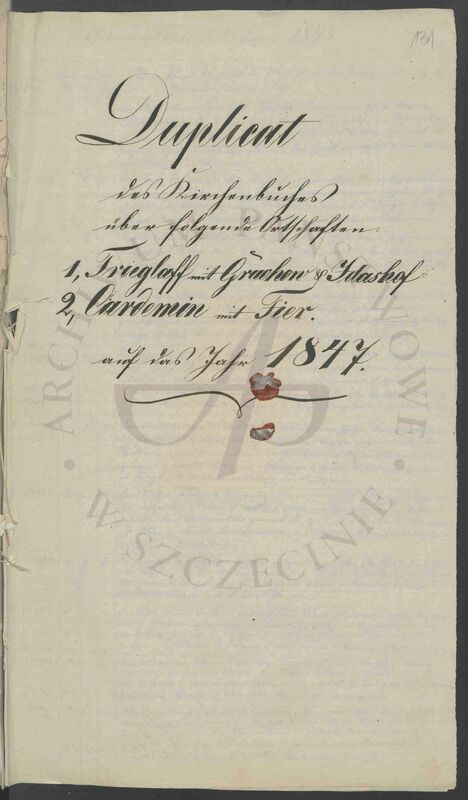 Sept 1859 – Karolina, Kreis Czarnikau – Wilhelmine Winkelmann is living here per her marriage record. 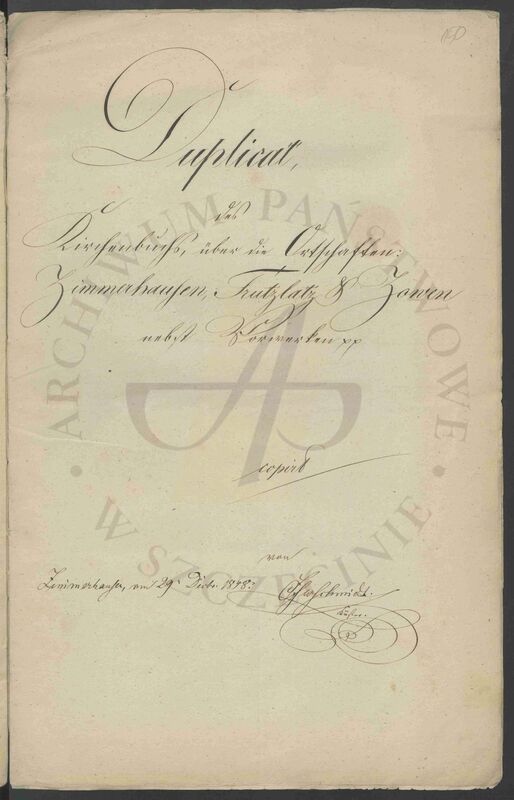 30 Oct 1859 – Karolina, Kreis Carnikau – Marriage of Carl Friedrich Schmidt from Modderpfuhl, son of the deceased kolonist Johann Ludwig Schmidt, to Wilhelmine Winkelmann, daughter of the kolonist Christian Winkelmann from Karolina. 14 Feb 1864 – Karolina – Marriage of Wilhelm Friedrich Prielipp resident of Karolina with Hanna Auguste Friedericke Winkelmann, daughter of the Kolonist Christian Winkelmann of Karolina. 10 Nov 1865 – Karolina, Kreis Czarnikau – Birth of Alvine Bertha Schmidt to the “kolonist” Carl Friedrich Schmidt and Wilhelmine Winkelmann. 18 Jan 1869 – Karolina, Kreis Czarnikau – Birth of Amelie Franzisca Schmidt to Carl Friedrich Schmidt and Wilhelmine Winkelmann. 19 Feb 1871 – Stieglitz, Kreis Czarnikau – Marriage of the bachelor Ludwig Gustav Neumann, age 22, and Antonie Winkelmann, age 20. 19 Mar 1871 – Stieglitz, Kreis Czarnikau – Marriage of the bachelor journeyman carpenter Franz Winkelmann with Miss Bertha Ohst. 18 Aug 1872 – Karolina, Kreis Czarnikau – Birth of Auguste Marie Winkelmann to the Kolonist Franz Winkelmann and Bertha Ohst. Godparents were Emilie Ohst, Auguste Pontow, and Mrs. Auguste Elftmann. 31 Aug 1872 – Karolina, Kreis Czarnikau – Birth of Antonie Wilhelmine Schmidt to the “kolonist” Friedrich Schmidt and Wilhelmine Winkelmann. Godparents were Miss Pauline Winkelmann (aunt to Antonie, sister to Wilhelmine Winkelmann), Mrs. Wilhelmine Winkelmann née Dumke (aunt of Antonie, wife of Christian Friedrich Julius Winkelmann), and Gustav Elftmann. 7 Aug 1874 – Karolina, Kreis Czarnikau – Pauline Winkelmann is listed on the baptism of her nephew Gustav Eduard Winkelmann. 25 Nov 1875 – Gornitz, Kreis Czarnikau – Birth of Auguste Pauline Schmidt to the “eigenthümer” Carl Friedrich Schmidt and Wilhelmine Winkelmann. 11 Jan 1880 – Gornitz, Kreis Czarnikau – Birth of Auguste Bertha Schmidt to the “kolonist” Carl Friedrich Schmidt and Wilhelmine Winkelmann. 26 Jan 1880 – Karolina, Kreis Czarnikau – Marriage between the “Tischler” [carpenter or cabinet maker or joiner] Carl Ludwig Hermann Gonitz, and Marie Pauline Winkelmann, daughter of the Leibgedinger [laborer] Christian Winkelmann and his wife Johanna Charlotte née Börk from Karolina. 14 Dec 1886 – Karolina, Kreis Czarnikau – Death of Christian Julius Winkelmann. The Kolonist [farmer] Michael Zadow resident of Carolina reports, that the Leibgedinger [laborer] Christian Winkelmann, 78 years old, of evangelical religion, resident of Carolina, born in an unknown location, laborer for the reporting person, died on 14 Dec 1886, at 1 p.m., in the domicile of the reporting person. Signed, Michael Zadow. According to the subsequent declaration of the Kolonist Michael Zadow from Carolina concerning the hearing from July 7th and 22nd 1888, the deceased laborer Christian Winkelmann was born in Bergthal (sic, Bergdorf), Kreis Friedeberg, and was married to the deceased Charlotte née Börke. The names of the laborer Christian Winkelmann’s parents’, their rank, status and where they lived, is unknown. 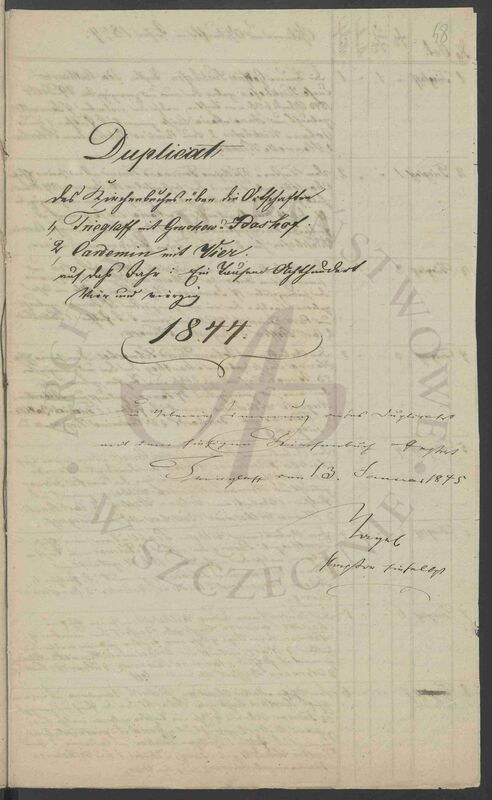 Mar 1891 – Stieglitz, Kreis Czarnikau – Carl Friedrich Schmidt and Wilhelmine Winkelmann are said to be resident here per the marriage record of their daughter Emilie Schmidt. C.F. Schmidt is listed as “Häusler” (Cottager). 28 Mar 1891 – Stieglitz, Kreis Czarnikau – Marriage of the laborer (Arbeiter) Christian Karl, son of the laborer (Arbeiter) Daniel Karl and his wife Regine née Seeger, both residents of Klebow, and Emilie Franziska Schmidt, born the 18th of January 1869 in Karolina, Kreis Czarnikau, resident of Stieglitz, Kreis Czarnikau, daughter of merchant (Händler) Friedrich Schmidt and his wife Wilhelmine née Winkelmann, both residents of Stieglitz. Witnesses: Merchant Ferdinand Schmidt, 46 years old, resident of Stieglitz, and the laborer Gustav Wehrmann, 24 years old, resident of Stieglitz. 11 Jul 1892 – Departure of SS Ems with Wilhelmine Winkelmann and her daughters Alvine and Bertha and grandson Wilhelm Karl for Wisconsin. 8 Mar 1902 – Schönlanke – The carpenter Gustav (Edouard) Winkelmann (son of the deceased), resident of Schönlanke, reported that the “Bauunternehmer” (building contractor) (Christian Friedrich) Julius Winkelmann, 58 years old, resident in Schönlanke, born in Alt-Beelitz (near Driesen), married to Wilhelmine nèe Dumke, still resident here, son of the deceased “Landwirt” (farmer) (Christian Julius) Winkelmann who lived in Karolina, died in Schönlanke in his home on 8 Mar 1902, 7:45 p.m. This document is an attempt to outline what we know about the family of my 3x-great-grandfather Carl Friedrich Schmidt (1835-1892). The Schmidts seem to have once lived in Kreis Arnswalde, then movied to Kreis Friedeberg before settling in the towns of Karolina, Stieglitz, and Gornitz in Kreis Czarnikau, some distance to the East. 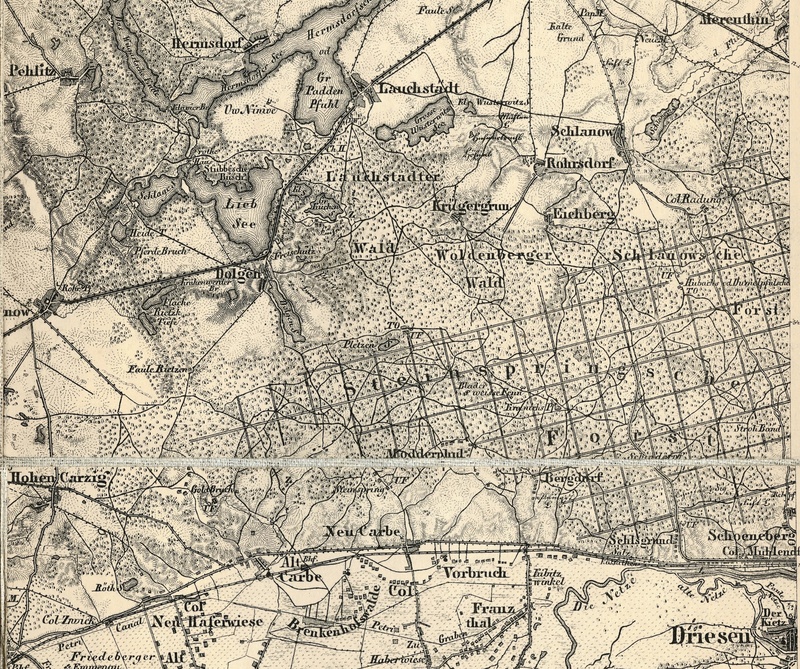 Map showing Marienwalde, Kreis Arnswalde (top) and Modderpfuhl, Kreis Friedeberg (bottom). abt 1800 – Marienwalde, Kreis Arnswalde – Birth of Johann Christian Ludwig “Ludwig” Schmidt to unknown parents. Said to have been a “kolonist” or settler and farmer in the marriage document of his son Carl Friedrich Schmidt. Said to be an Eigenthümer (farm owner) on marriage record of son Ferdinand Schmidt. Said to be Einwohner (citizen) on marriage record of son Wilhelm Ludwig Schmidt. Possible siblings to Ludwig include Gottfried, Georg, and Johann Schmidt, who all have records in Steiglitz/Schönlanke. abt 1825 – Marienwalde, Kreis Arnswalde – Marriage of Ludwig Schmidt with Christiane Krüger. Jun 1826 – Marienwalde, Kreis Arnswalde – Birth of August Schmidt to Ludwig Schmidt and Christiane Krüger, per August Schmidt’s death record. 23 Nov 1832 – Modderpfuhl, Kreis Friedeberg – Birth of Wilhelm Ludwig Schmidt to Johann Ludwig Schmidt and Christiane Krüger, per WL Schmidt’s marriage record. 1835 – Modderpfuhl, Kreis Friedeberg – Birth of Carl Friedrich Schmidt to Johann Ludwig Schmidt and Christiane Krüger, per CF Schmidt’s marriage record. 1844 – Modderpfuhl, Kries Friedeberg – Birth of Johann Ferdinand “Ferdinand” Schmidt to Johann Ludwig Schmidt and Christiane Krüger, per Ferdinand Schmidt’s marriage record. abt 1855 – Modderpfuhl, Kreis Friedeberg – Marriage of August Schmidt to first wife Wilhelmine Mathes. 15 Jun 1859 – Weissfenn, Kreis Friedeberg – Birth of Alvine Auguste Schmidt to August Schmidt and Wilhelmine Mathes, per her death record. Sept 1859 – Modderpfuhl, Kreis Friedeberg – Carl Friedrich Schmidt is living here per his marriage record. 7 Aug 1862 – Weissfenn, Kries Friedeberg – Birth of Carl Ernst Wilhelm Schmidt to Carl Friedrich Schmidt and Wilhelmine Winkelmann. 18 Sept 1864 – Karolina, Kries Czarnikau – Marriage of the bachelor and journeyman carpenter Wilhelm (Ludwig) Schmidt, from Karolina, age 32, son of the deceased “ein.” (possibly einwhoner/resident or einlinger/farm-worker) Christian Ludwig Schmidt and Miss (Ottilie) Sophie Pauline Habermann, age 24, daughter of the kolonist Christoph Habermann. abt 1864 – Stieglitz, Kries Czarnikau – Divorce of August Schmidt and first wife Wilhelmine Mathes, per death record for Alvine Auguste Schmidt. abt 1865 – Stieglitz, Kreis Czarnikau – Marriage of August Schmidt to Emilie Alvine Krüger. 17 Jun 1866 – Stieglitz, Kreis Czarnikau – Birth of Luise Bertha Schmidt to August Schmidt and Emilie Alvine Krüger. 19 Jun 1866 – Karolina, Kreis Czarnikau – Birth of Ottilie Auguste Schmidt to Wilhelm Ludwig Schmidt and Sophie Pauline Habermann. 25 Oct 1867 – Karolina, Kreis Czarnika – Birth of Emilie Auguste Schmidt to Wilhelm Ludwig Schmidt and Sophie Pauline Habermann. 2 Apr 1869 – Karolina, Kreis Czarnikau – Departure of Wilhelm Ludwig Schmidt for Wisconsin with wife and two daughters aboard the “SS America”. Passenger list lists Karolina as last place of residence. Wilhelm is listed as a carpenter. 19 Oct 1872 – Stieglitz, Kreis Czarnikau – Birth of Emma Wilhelmine Schmidt to August Schmidt and Emilie Alvine Krüger. 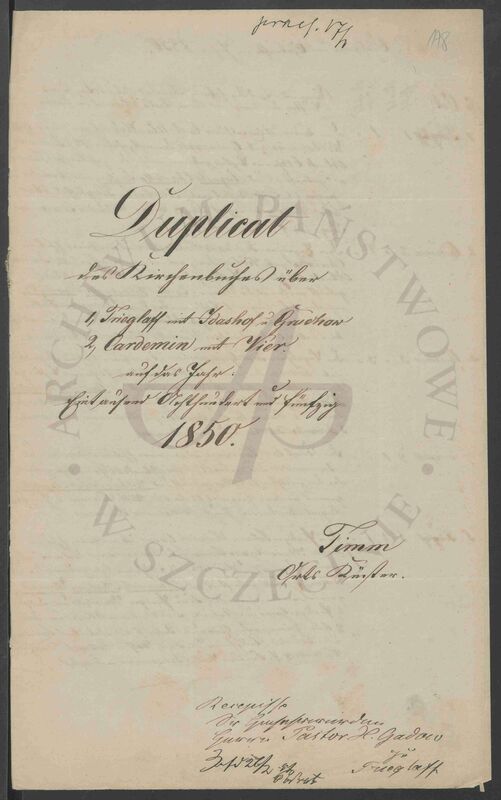 24 Apr 1874 – Stieglitz, Kreis Czarnikau – Marriage of the journeyman carpenter [Zimmergesell] and bachelor Ferdinand Schmidt, age 30, from Stieglitz, son of the deceased property-owner [eigenthümer] Ludwig Schmidt from Stieglitz, and Miss Wilhelmine Dietert, 22 years old, from Stieglitz. 23 Jul 1874 – Stieglitz, Kreis Czarnikau – Birth of Anna Emilie Schmidt to August Schmidt and Emilie Alvine Krüger. 21 May 1883 – Stieglitz, Kreis Czarnikau – Birth of August Otto Schmidt to August Schmidt and Emilie Alvine Krüger. 10 Apr 1885 – Stieglitz, Kreis Czarnikau – Birth of Adelegund Ida Schmidt to August Schmidt and Emilie Alvine Krüger. Jun 1885 – Gornitz, Kreis Czarnikau – Departure of Carl Ernst Wilhelm Schmidt to Wisconsin, per his military passport. 18 Apr 1888 – Stieglitz, Kreis Czarnikau – Birth of Minna Marta Schmidt to August Schmidt and Emilie Alvine Krüger. Mar 1891 – Stieglitz, Kreis Czarnikau – Ferdinand Schmidt said to be resident here per the marriage of his daughter Emilie Schmidt. Listed as händler (merchant). 24 Jun 1891 – Stieglitz, Kreis Czarnikau – Birth of Gustav Albert Karl and Wilhelm Friedrich Karl to Christian Karl and Emilie Schmidt. 5 Apr 1892 – Departure of the SS Aller with Amelie Schmidt and her husband Christian Karl and son Gustav Karl for Wisconsin. 28 May 1906 – Driesen, Kreis Friedeberg – Johann Gustav Schmidt is listed as a tailor living here on marriage record of his sister Bertha Louise Schmidt and Adolf Otto Schöning. 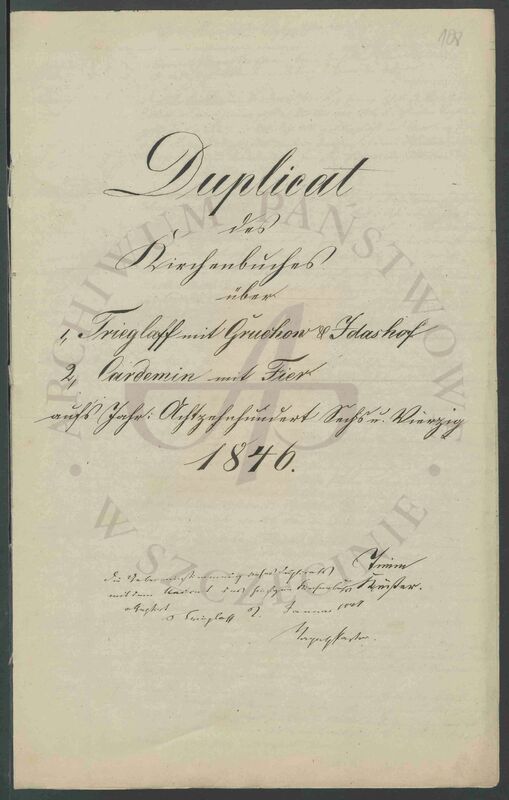 1 Apr 1907 – Driesen, Kreis Friedeberg – Johann Gustav Schmidt is listed as a tailor living here on marriage record of his sister Anna Antonie Schmidt and Gustav Emil Knöpke. 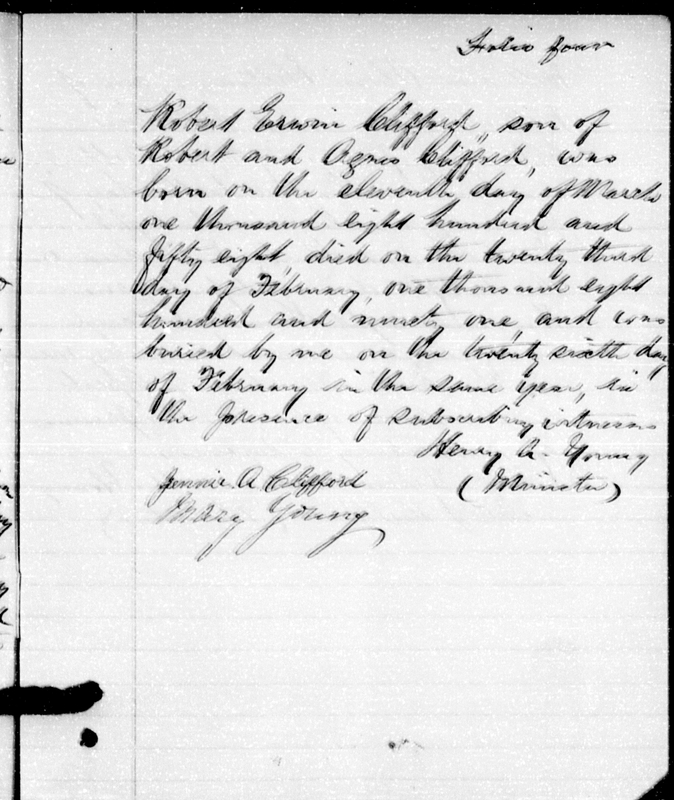 Robert Erwin Clifford (called by my grandmother “Robert Clifford Jr.”, but I’m not sure “Jr.” is really warranted because I think his middle name was different than his father’s) was the brother of my great-great-grandmother Anna Clifford. He was born 11 Mar 1858 in Alburg, Grand Isle, Vermont to Robert Clifford and Agnes McWhirter, both of whom were Irish immigrants. Robert was in the 1860 and 1870 Census reports for Alberg, Vermont with his family, then sort of fell off the face of the planet. My grandmother had noted in her genealogical records “Robert left home and was never heard from again”. So I went looking for him. 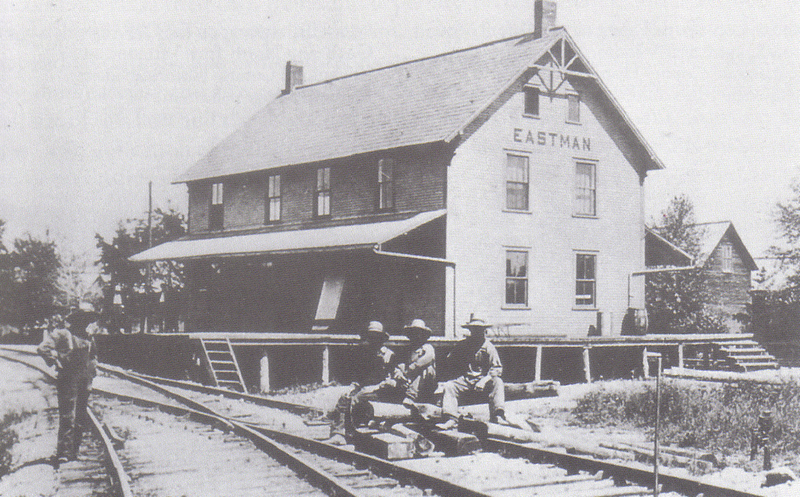 Robert Clifford, a station agent at Eastman, P.Q., a former very popular townsman, died last week. Lizzie and Nellie Clifford, his sisters, went to attend the funeral. So this explained why he had “vanished”. He had moved out of the country to Quebec, Canada. It also showed that at least two members of his immediate family knew of his death, even if my line of his family didn’t seem to know he had died. I found a photo of his gravesite on FindAGrave.com. His gravestone is in the South Stukely Cemetery, South Stukely, Quebec, Canada. Plot: Range 9 Lot 3 No 2. It says he died on 23 Feb 1891 at the age of 32. One source of confusion could have been that his father, Robert Clifford, died 14 Mar 1891, and the son (also Robert Clifford) died 23 Feb 1891, less than three weeks apart. Perhaps the news of the “Death of Robert Clifford” got conflated in my part of the family. Robert had married Jennie Adeline Dingman on 24 May 1886 at the Stuckley-Sud Anglican Church near Eastman, Quebec, Canada. Jennie Adeline was born 24 May, 1865 to Alvin Dingman and Harriet Melinda Horner, and had three brothers: Hubert, James, and Frank Dingman. In several of the records that mention him, Robert was listed as a “Station Agent”, which is someone who worked to handle freight stock, handle the track switches, sell tickets, and perhaps might have done accounting or operated the telegraph. In February of 1891, Robert was killed in an accident at the train station where he worked. He was on top of a train car that derailed due to ice buildup. The train slid down an embankment and he was crushed in the ensuing crash. Waterloo Advertiser, Waterloo, Quebec. 1891-02-27, p2. Courtesy of Serge Wagner. Jennie and the kids are shown in the 1901 Census for Eastman, where she is listed as a widow. Her father and brother are listed nearby. She is also in the 1911 Census with all three kids. Harry is listed as a “stationary engineer in saw mill”, Frances is listed as a “sales lady in retail grocery store”, and Inez is listed as working as a “domestic (servant) for a private family”. Their mother has her occupation listed as “none”. Jennie died in Eastman on 14 Jan 1914 at the age of 48, and was buried next to her husband. Jennie Frances Clifford is in the 1891, 1901, and 1911 Census records for Eastman. There is a record of her going to visit her Aunt Margaret Clifford in Winooski, Vermont from 1917 where she is listed as living at Notre-Dame-de-Graces, outside Montréal with her brother Harry. She is in the 1921 Census for Saint-Jean-sur-Richlieu where she is listed as “single”, so I don’t believe she ever married. There are indications she died in 1942 in Hemmingford, Canada, but so far I haven’t found documents that show this. Harry Clifford became an engineer, and I was able to find him in the 1921 Census living with his sister Francis in Saint-Jean-sur-Richelieu, Québec, Canada, which is just outside Montréal. He was married to Margaret Estella “Maggie” Marshall, and had two children, Robert Marshall Clifford (b 4 Sept 1915) and Dorothy Evelyn Clifford (b 7 Feb 1919 – 9 Jul 1955). Dorothy married Douglas Humphries Pimlott, and they had at least two sons, Peter Clifford Pimlott (1948-2010), and Mark Pimlott (who was born 13 Jun 1950 in my home town of Madison, Wisconsin, USA). Harry died in Ormstown, Québec in 1963. Most members of my Cairns family line were from Ormstown… just an odd coincidence. Inez Winifred Clifford married George James Brown (1891-1979) at Saint-Jean-sur-Richlieu on 14 Oct 1920. I have not found any children so far for them. She died in 1955 in Hemmingford, and is buried there. Once again I sent my hired researcher in quest of any Prussian records, this time for the Krüger/Krueger family in parish Wittenfelde from 1824-1850. 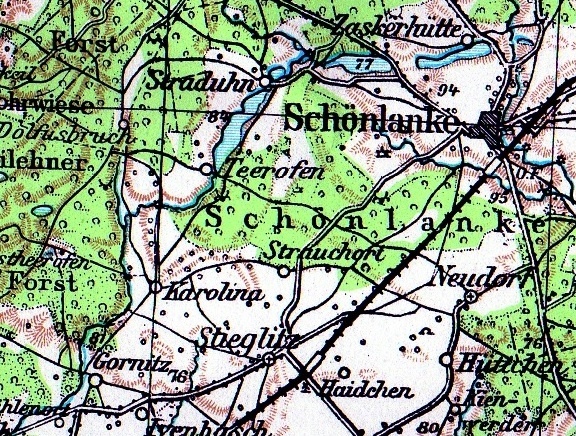 Wittenfelde was in Kreis Cammin, Pommern, Prussia and the records mention the towns of Stuchow, Staarz, Königsmühl, Bandesow, Medewitz, Völzschenhagen, Wittenfelde, Moltstow, Tetzlaffshagen, Kambz, and Völtzin, among others, not all of which were in the parish. The transcriptions are below. I have scans of the actual documents also. Wittenfelde Parish. Towns in the records are in yellow. 1. Johann Joachim Kuhfahl, instmann (farm worker) in Staartz, married Sophia Krüger. 1.1. August Ferdinand, born on 5 Feb 1824, baptized on 15 Feb 1824. (Wittenfelde, 2/1824). Godparents: 1. Joachim Friedrich Köbsell, young farmer in Staartz. 2. Michael Friedrich Hakbarth, shepherd son in Königsmühl. 3. Dorothea Wilhelmine Zautken, shepherd daughter in Bandesow. 2. Caspar Friedrich Krüger, shepherd in Medewitz, was married to Maria Louisa Pipenberg. 2.2. Amalia Charlotte Louise, born on 7 Aug 1826, baptized on 19 Aug 1826. (Wittenfelde, 11/1826). Godparents: 1. Maria Christine Falke wife of Pipenberg in Moltstow. 2. Miss Charlotte Louise Krüger from Tetzlaffshagen. 3. Michael Friedrich Pipenberg, herdsman in Simoetzel (east of Greifenberg). (She died on 21 Sept 1829 from consumption, age 2 years/14 days. Wittenfelde, 10/1829). 3. Ernst Friedrich Schmeling, kossäth (farmer on small farm) in Stuchow, oldest son of the deceased kossäth Christoph Heinrich Schmeling from Stuchow married on 8 Jun 1824 Dorothea Wiilhelmine Krüger, youngest daughter of Christoph Gottlieb Krüger, Wirtschafter (economist/manager) in Schruptow. 4. Johann Gottlieb Krüger, farmer in Medewitz, was married to Anna Louise Stäve (Stewe). 4.1. Christian Friedrich Wilhelm Krüger, born in 1816. 4.3. Johann Gottlieb Krüger, born in 1821. 4.3. Caroline Wilhelmine Sophie Krüger, born in 1824, confirmed in 1838 in Wittenfelde, from Medewitz, age 14 years/ 3 month. (Wittenfelde, 5/1838). 4.5. Johanna Wilhelmine Ernestine Krüger, born on 26 Feb 1830, baptized on 16 Mar (Wittenfelde, 5/1830). Godparents: 1. Miss Maria Louise Hannemann from Medewitz. 2. Miss Hanna Louise Hannemann from Kambz. 3. Johann Wilhelm Varchow, farmer’s son in Medewitz. 4.1.1. Johann Friedrich Ferdinand Krüger, illegitimate child, born on 7 Jul 1839, baptized on 14 Feb 1839. (Wittenfelde, 10/1839). Godparents: 1. Johann Friedrich Warschow, farmer’s son in Medewitz. 2. Joachim Friedrich Krüger, farmer’s son in Medewitz. 3. Ernestine Wilhelmine Last, miller’s daughter in Medewitz. 4.1.2. Johann August Ludwig Krüger, born on 13 Feb 1849, baptized on 25 Feb 1849. (Wittenfelde, 5/1849). Godparents: 1. August Ferdinand Labs, master tailor in Völschenhagen. 2. Johann Gottllieb Ludwig, laborer in Güskow. 3. Miss Marie Sophie Ladwig from Königsmühl. to 4.2. Joachim Friedrich Krüger, farmer in Medewitz, age 24, married in 1846 Wilhelmine Friederike Kasten, daughter of farmer and courtman Kasten in Behlkow. (Marriage announcement on 2nd , 3rd and 4th Sunday after Epiphanias in Wittenfelde 1846). 4.2.1. Auguste Wilhelmine Bertha Krüger, born on 17 Sept 1847, baptized on 26 Sept 1847. (Wittenfelde, 17/1847). Godparents: 1. Gottfried August Labs, tailor in Völschenhagen. 2. Engel Lossin wife of Dobberphul in Carnitz. 3. Friedrike Watchow, farmer’s daughter in Muddelmow. to 4.4. Gottlieb August Ferdinand Labs, tailor in Völschenhagen, age 26 ¾ , married on 31 Oct 1845 Caroline Wilhelmine Sophie Krüger, age 21, daughter of Johann Gottlieb Krüger, farmer in Medewitz. (Wittenfelde, 3/1845). 5. Johann Gottlieb Heinrich Tesch, kossäth and Krüger (barkeeper), was married to Wilhelmine Dorothea Krüger. Dorothea Wilhelmine Krüger, wife of Kossath Johann Tesch in Stuchow, died on 5 Dec 1849 on Consumption, age 47 years/4 month/8 days, buried on 8 Dec 1849. She left behind a widower and 2 daughters in 1st marriage and 3 sons and a daughter in 2nd marriage. (Wittenfelde, 12/1849). 5.1. Johann Ludwig Julius Tesch, born on 14 Feb 1837, baptized on 14 Feb 1837. (Wittenfelde, 4/1837). Godparents: 1. Carl Ludwig Jüch, day-laborer in Stuchow. 2. Johann David Raasch, day-laborer in Stuchow. Dorothea Maria Tesch, daughter of the kossäth and Church warden Tesch in Stuchow. 6. Dorothea Marie Krüger, wife of büdner Johann Gottfried Wetzel in Neuenhoefe, died on 20 Nov 1842, age 73 years/1 month/11 days (b 1769), buried on 24 Nov 1842. She left behind a husband, 4 sons and 2 daughters. (Wittenfelde, 17/1842). 7. Michael Friedrich Wilhelm Krüger, farmhand in Klötzin, was married to Caroline Wilhelmine Henriette Mierke. Caroline Wilhelmine Henriette Mierke, wife of farmhand Michael Friedrich Krüger in Klötzin, died on 27 Aug 1844, age 24 years/11 month/5 days (b 1819), buried on 30 Aug 1844. She left behind a widower and a young son. (Wittenfelde, 8/1844). 7.1. Carl Wilhelm Augus Krüger, born on 20 Jun 1842 in Stuchow, baptized on 25 Jun 1842. (Wittenfelde, 8/1844). Godparents: 1. Michael Friedrich August Mierke, herdsman’s son in Stuchow. 2. Carl Krüger, farmhand in Benz, deputy: altsitzer (pensioner) Johann Krüger in Tetzlaffshagen. 3. Wilhelmine Charlotte Mierke, herdsman’s daughter in Stuchow. 9. Gottlieb Heinrich Ferdinand Krüger, herdsman in Stuchow, age 22 , married on 10 Jul 1846 Caroline Friederike Henriette Schmeling, age 21, step daughter of Johann Tesch, barkeeper in Stuchow. (Wittenfelde, 2/1846). 9.1. Auguste Dorothea Krüger, born on 18 Aug. 1846 in Stuchow, baptized on 22 Aug 1846. (Wittenfelde, 15/1846). Godparents: 1. Johann Tesch, barkeeper in Stuchow. 2. Dorothea Tesch wife of the coachman Barkow in Stuchow. 3. Christine Knuth wife of the kossäth Jüth from Stuchow. 10. Johann August Gottlieb Krüger from Medewitz, age 14 years/2 month/3 days (b 1832), confirmed in 1846 in Stuchow. (Wittenfelde/Stuchow, 3/1846). 11. Hermann Krüger, joiner in Stuchow, was married to Wilhelmine Schützke (Schätzke). 11.1. Caroline Friederike Auguste Krüger, born on 23 Jul 1846 in Stuchow, baptized on 25 Jun 1846. (Wittenfelde, 14/1846). Godparents: 1. Carl Thiele, forrester in Stuchow. 2. Dorothea Friederike Sanow wife of the laborer Kuhphal from Stuchow. 3. Caroline Albertine Schmidt, daughter of midwife Ehlke in Stuchow. 11.2. Wilhelmine Josephine Ernestine Krüger, born on 9 Nov 1848 in Stuchow, baptized on 10 Dec 1848. (Wittenfelde, 26/1848). Godparents: 1. Ferdinand Krüger, herdsman in Stuchow. 2. Wilhelm Kuhphal, daylaborer in Stuchow. 3. Ernestine Stewe widow of Lüdke from Stuchow. 4. Philippine Wendland, wife of the miller Burow in Stuchow. 5. Henriette Hege, daylaborer daughter in Stuchow. 12. Johann Ludwig Krüger, farmhand in Medewitz, age 24, married in 1846 Anna Sophie Friederike Hinz, age 22, daughter of Franz Emanuel Hinz, day-laborer in Ribbekardt. Marriage announcement on 24th, 25th Sunday after Trinitatis and 1st advent in Wittenfelde 1847. 12.1. Johann Friedrich Ferdinand Krüger, born on 30 Sept 1848 in Medewitz, baptized on 1 Oct 1848. (Wittenfelde, 17/1848). Godparents: 1. Johann August Pump, herdsman in Medewitz. 2. Johann Gottlieb Böttcher, farmhand in Medewitz. 3. Friederike Wilhelmine Ginner, farmer’s daughter in Medewitz. 13. Carl Gottlieb Krüger, resident of Medewitz, was married to Anna Marie Friederike Wilhelmine Bartelt. 13.1. August Friedrich Wilhelm Krüger, born on 4 Dec 1848 in Medewitz, baptized on 14 Dec 1848. (Wittenfelde, 22/1848). Godparents: 1. Wilhelm Friedrich Bliese, teacher in Medewitz. 2. Johann Carl Bärenwaldt, farmer’s son in Medewitz. 3. Justine Bärenwaldt, farmer’s daughter in Medewitz. The child died on 15 Dec 1848. (Wittenfelde, 11/1848). 13.1. Wilhelmine Friederike Elwine Krüger, born on 3 Dec 1849 in Medewitz, baptized on 9 Dec 1849. (Wittenfelde, 31/1849). Godparents: 1. Wilhelm Krüger, daylaborer in Tetzlaffshagen. 2. Wilhelmine Bärenwaldt, farmer’s daughter in Medewitz. 3. Miss Friederike Krüger, from Medewitz. 14. Wilhelm Krüger, daylaborer in Lüttkenhagen, was married to Friederike Otto. 14.1. Auguste Henriette Louise Krüger, born on 21 Jul 1848 in Lüttkenhagen, baptized on 6 Aug 1848. (Wittenfelde, 20/1848). Godparents: 1. August Borchardt, farmer and mayor’s son in Lüttkenhagen. 2. Henriette Sophie Retzlaff wife of the Cartwright Dreyer in Bandesow. 3. Miss Caroline Dorothea Krüger from Cammin.